You don’t have to hail from California to get in on what will be the biggest cannabis market in the world. The state’s new medical and recreational marijuana programs don’t have a residency requirement – a fact that could attract droves of out-of-state entrepreneurs to California and revive memories of the 1849 Gold Rush. But does that mean cannabis entrepreneurs can stroll into California and open a business? While there are no legislative or legal obstacles to non-California marijuana businesses at the state level, they do exist at the local level, in terms of regulations, real estate and culture. “There will be tremendous opportunities,” said Avis Bulbulyan, CEO of Siva Enterprises, a Los Angeles-based, cannabis-focused consultancy. While California’s new MMJ and adult-use law doesn’t mandate state residency, it does require business license applicants to first have a local MJ business permit before they can apply for a state permit. And many of those municipalities require marijuana business operators to be residents of California or the municipality where they want to apply. “You can’t apply for a state license until you have a local permit. So, a lot of this is determined by a local permit,” said attorney Joe Rogoway, head of the California-based Rogoway Law Group. Los Angeles attorney Hilary Bricken noted some places stack the deck in favor of residents. For example, some towns may ban non-California residents from holding a license altogether, while others may allow out-of-staters to hold only a minority stake of a license, attorneys said. Take Los Angeles. Its draft industry regulations – which are still being finalized – say no out-of-state companies can come in and set up a business, according to Bricken. Businesses must have some California ownership. In Hollister, southeast of San Jose, a local resident must have at least a 50% stake in any MMJ or rec business located in the city. Other municipalities may not have residency requirements but will put up other “protectionist” measures that give existing operators an inside track. For example, two of the three counties in the Emerald Triangle – Humboldt and Mendocino – will require medical and recreational business owners to prove their company has been operating since before Jan. 1, 2016, Bricken noted. “While not a residency requirement, it’s definitely a protectionist measure to toss a bone to existing operators,” she added. Some towns and counties, meanwhile, have no barriers to outside businesses. 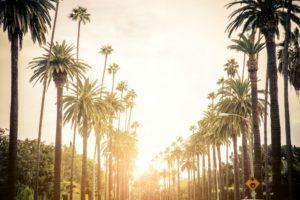 The best way to know for sure if the locale in which you want to start a marijuana business accepts out-of-state applicants is to check its MJ-related ordinances, which are often online. If not online, a phone call to the local government offices should generate an answer. “There are pockets that want the (economic benefits) and don’t care where the operators come from,” Bricken said. Of the communities that allow marijuana businesses, which ones are most likely to allow out-of-state license holders? Think Desert Hot Springs, Adelanto and San Bernardino, for example. Another consideration is how far along a municipality is in its decisionmaking process. If a city has already decided to allow marijuana businesses, it’s likely that many applicants have already lobbied local officials and have their ears, putting them at an advantage over other applicants, Bulbulyan said. They may want to shut the door to out-of-state entities, for example. So it’s better to look at cities that are considering accepting businesses but haven’t finalized their regulatory plans.